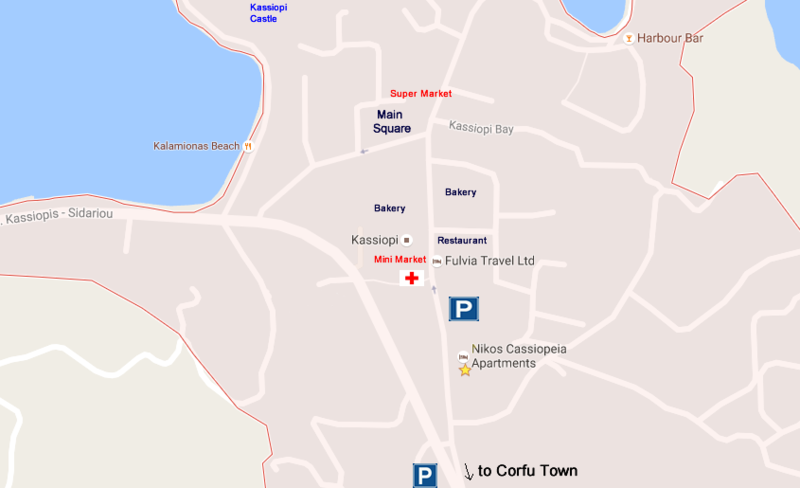 If you don’t have you own vehicle, we can arrange a transfer for you from Corfu airport to your accommodation in Kassiopi. Transfers are made by private 8, 12 or 16 seat mini busses or a taxi reservation can be arranged. If you arrive at Corfu Airport (Ioannis Kapodistrias – Pin A) turn right and follow the road all the way to the sea. Turn left at ‘Dimokratias Av’. On the roundabout turn left at ‘Alexandras Av’. The road will take to Corfu Port (Pin B). Follow the instructions provided to get to Kassiopi.